Today, May 7, is the 20th anniversary of the announcement of the engagement that would lead to a wedding, and ultimately divorce in one of the worst corporate marriages in history. At the time, I was the Detroit Bureau Chief and correspondent for CNN, so this was a big story for me to cover. I had no idea that nine years later I would be caught in the middle of the stormy split as a DaimlerChrysler employee. Indeed, disastrous corporate tieups seem to follow me. The first was the 2001 merger of CNN parent company Time Warner with AOL. The result was laying off about a thousand CNN employees and shutting down bureaus. That’s how I lost my job there after 20 years of service. I found my way to the print world, first as national auto reporter for the Associated Press, then General Motors beat writer for the Detroit News. Three years into that stint, I got a call that the head of PR for the Chrysler half of DaimlerChrysler was looking to start a media-oriented blog and wanted an auto writer to ghost write and manage it. Sold. Cool job. That job later was broadened to heading the company’s digital communications team, which included broadcast and social media. Fast forward to October, 2006. Plans were being made for DaimlerChrysler’s annual global news conference. This was always held at the company’s Stuttgart, Germany headquarters, but they were going to “trust” us to pull it off at Chrysler Group HQ in Auburn Hills, Michigan. Two members of the Daimler PR staff flew over to meet with us to start the communications planning. We knew things were off to a bad start when we were told the date chosen was Feb. 14, 2007 and that all communications with the media would be by fax. One of the announcements planned included plant closings and layoffs. We warned our German counterparts such an announcement on Feb. 14th would lead to headlines blaring, “Valentine’s Day Massacre!” They were unmoved. We also explained no one used fax machines anymore, but they remained steadfast insisting that’s how they did it in Germany. We suggested the use of fax machines was effective in guaranteeing no one would show up. Tough scheiss. Planning went along and on the appointed day I showed up at 4 a.m. to help direct the broadcast satellite and microwave trucks where to park and to help the crews set up. The first truck had barely arrived when I got a call from a reporter who could barely contain himself as he asked, “Hey! What’s going on. German publication Handelsblatt just reported they’re gonna announce they’re selling you guys off. Comment?” I was totally blindsided. We had heard not a word. I called my boss who at first stammered then promised some sort of statement shortly. It was not shortly. By then my phone was ringing off the hook asking about the Handlesblatt report. When I finally received the statement it was a non-committal corporate collection of words that didn’t completely spill the beans, but didn’t deny the reports. Things quickly got out of control. Now we had two disasters. An impending announcement of plant closings and layoff AND, with regard to the possible offloading of Chrysler, in the eventual words of DCX Chairman and CEO Dieter Zetsche, “all options are open.” Easily decipherable code for, “we’re ditching the Americans. Divorce is in the air.” Yes, it was a Valentine’s Day Massacre. Truthfully, we were relieved knowing within some period of time we’d be out from under the thumbs of the German management, but would miss many of our German colleagues who became good friends. We had no idea our new owners, Cerberus, would be an even bigger disaster. Personally, I wasn’t happy when they named it the Dart. We had a history. The good part was I passed my driver’s test in my brother’s ’65 Dart. The bad news is when I inherited that lemon during my senior year in college, first I got into an accident that crushed the trunk, then I decided to make a little $$ by offering a rides home and back for Thanksgiving break. The Dart would have none of it. Somewhere on Route 17 in the middle of the Catskills the Dart decided “no mas!” At least for a few hours while it took a long break on the shoulder and mocked me as I sprayed something into the carburetor that was supposed to cure what ailed it. My passengers were not amused and by the time we limped onto Long Island many hours later, they rather brusquely informed me they would find another ride back to school. The Dart appeared to have felt flush with victory at the news its mopey passengers wouldn’t be making the 300 mile return trip, and performed flawlessly on the way back. 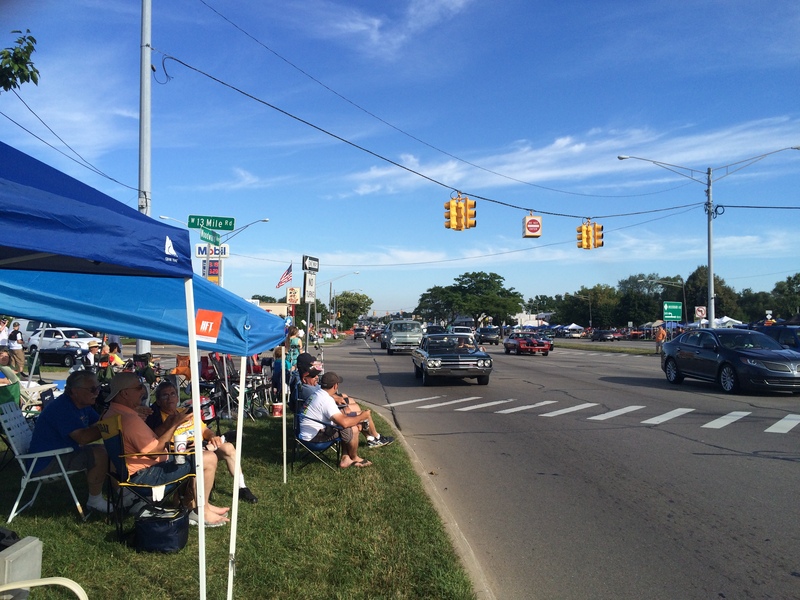 Except for a few stragglers and hopelessly lost out of towners the 2015 Woodward Dream Cruise is now over. For those who don’t know what the Dream Cruise is, think of a million people, some arriving days before the big event and camping out, simply to snag a good spot to watch traffic go by. The big difference is, when we were kids in Queens, we’d watch traffic on Union Turnpike go by and attempt to hitch a ride to the bowling alley where we spent most of the night away from the lanes and in the bar where bartender Jimmy gave us free salami, crackers and cheese and the occasional drink. The Woodward Dream Cruise started 20 years ago as a fundraising event in Ferndale..just over the borderline with Detroit. It’s become a very big deal where auto enthusiasts, collectors and the occasional Uber driver relive the glory days of cruising historic Woodward Avenue by doing so. 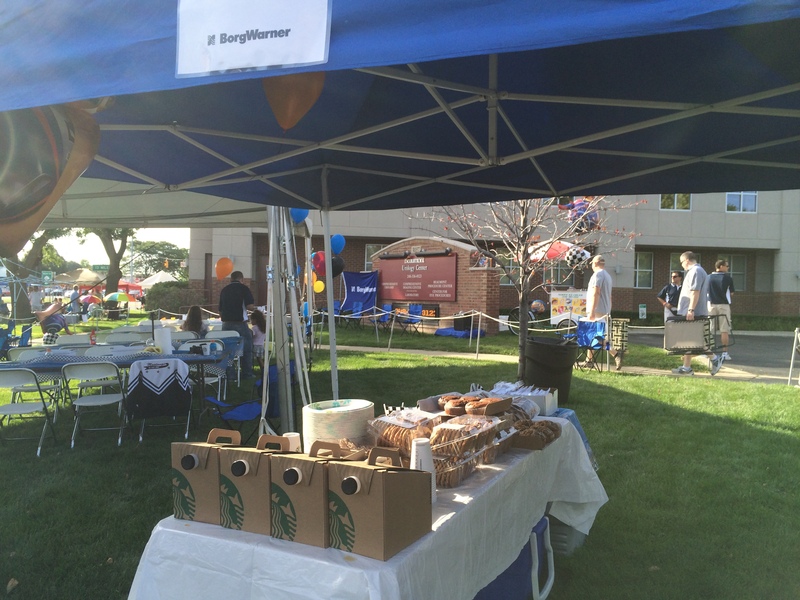 I thought it was especially appropriate that one group of spectators set up a table loaded down with coffee dispensers in front of the local urology clinic. Yup…cars, caffeine and kidneys. Has there been a more perfect combination? 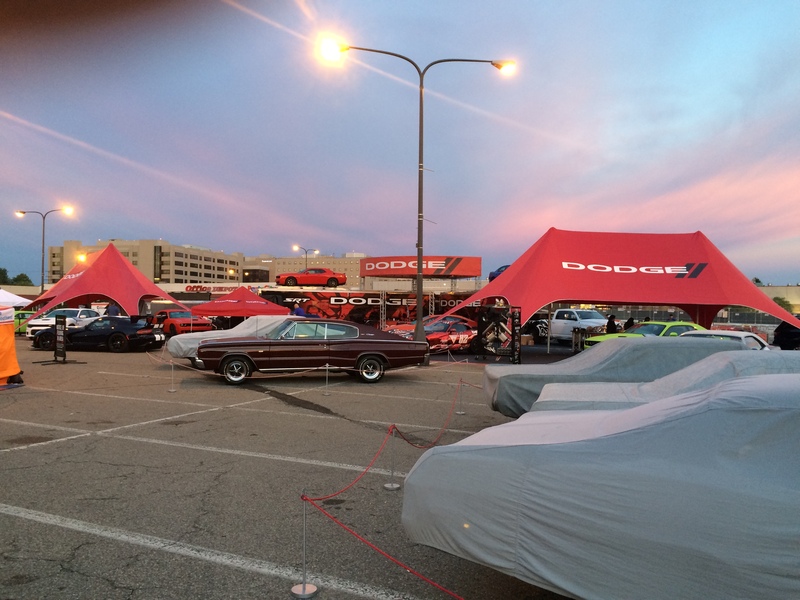 My company, Fiat Chrysler Automobiles, has a lot of fun with it and set up a giant area called Dodge Rock City, where attendees can get thrill rides that dislodge recent meals, win prizes, hear some music and most of all, see some very cool classic and current vehicles. Guess you can tell, I’m not what you would call a “car guy.” I don’t have gasoline in my veins, although I once drank a bottle of Jolt Cola. I do enjoy driving and riding in a fine vehicle, especially if the cupholders are grippy and the radio works well. That reminds me of my very first car. It was a used 1962 Pontiac Tempest. Had two doors, one of which worked. The other one stuck, except when I was cruising Union Turnpike with my friends and as I took a corner a little too fast, the chunky guy in the passenger seat leaning a little too hard on the door and dislodged it. We all got a pretty good laugh as Bubba hung on for dear life, but such were the joys of cruising. I didn’t see anything like that at the Woodward Dream Cruise, although I thought I saw one guy with a deathgrip on a Bud in his tent along the curb.